The all-new 2019 Ram 3500 comes with single or dual rear wheels. 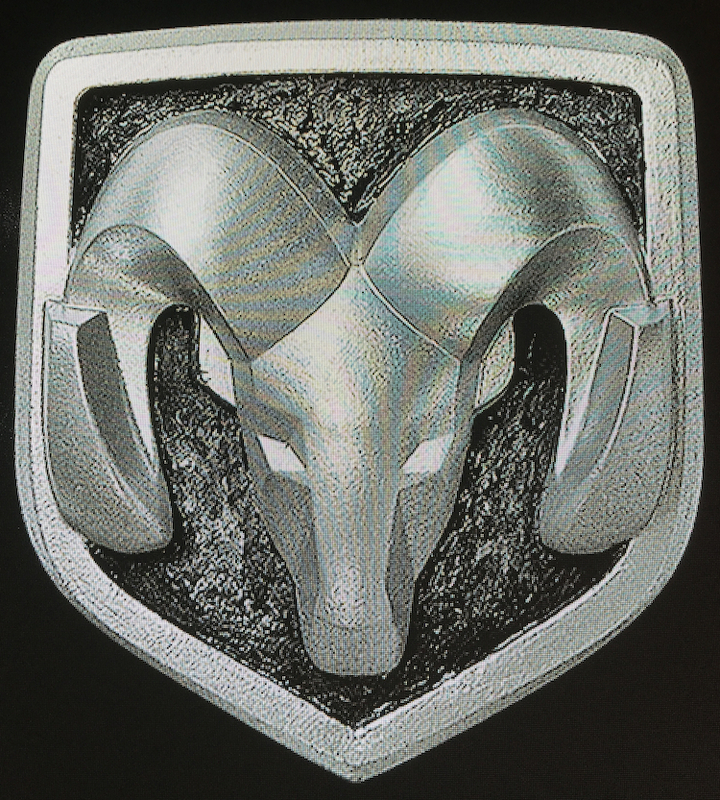 The Ram brand has been on an upward trajectory ever since it was separated from Dodge beginning in 2009. Ram Trucks represent a variety of utility-type vehicles, but its flagship product has always been its line of full-size pickup trucks, which are chiefly sold in North America. Ram has steadily grown its brand with its big pickup trucks accounting for the majority of the growth. Indeed, the all-new-for-2019 pickups recently passed the Chevrolet Silverado line in U.S. sales, taking over second place behind the Ford F-150. The new trucks have received much praise for their styling inside and out, as well as for their updated powertrains and technologies. Ram Trucks separates its full-size models into 1500, 2500, 3500, 4500, and 5500 Series lines. The 1500 is its light-duty line, while its 2500 and 3500 models represent its heavy-duty trucks. As for the 4500 and 5500, these ones are commercial grade vehicles — chassis cab models that are routinely upfitted into dump trucks, panel trucks, ambulances, and so forth. There is one thing common to most 3500, 4500, and 5500 models — available dual rear wheels (DRW). Ram offers this arrangement with both its rear- (4×2) and four- (4×4) wheel-drive trucks. It supplies improved handling and towing, the latter raising Ram’s already lofty towing capabilities skyward. Ram offers customers a choice of Regular, Mega & Crew Cab setups. For 2019, the Ram 3500 is available in Regular, Mega and Crew Cab configurations. Besides 4×2 and 4×4, you’ll find either six-foot-four-inch or eight-foot boxes. You also have a choice of either a 6.4-liter heavy-duty V8 HEMI gas engine or a 6.7-liter Cummins inline-six turbodiesel engine. Ram further separates the Cummins offering into standard and high-output options. The gas engine works with an 8-speed automatic transmission, while the diesel is paired with one of two six-speed automatic transmissions. Five model choices are available, beginning with the Tradesman regular cab 4×2 ($36,540). From there, your choices include the Big Horn ($40,890), Laramie ($52,245), Laramie Longhorn ($59,545), and Limited ($67,685) models. These prices include the $1,695 destination charge. The Tradesman and Big Horn are offered in Regular, Mega and Crew Cab configurations, while the other three do not offer the Regular Cab. Further, the Mega Cab is available only as a 4×4 model. Are you confused yet? It only gets more confusing, which is why we don’t break down the various trims, packages, and offerings as we do with other model types. Instead, a visit to the Ram Trucks configurator page is in order. Notwithstanding the many possible build-it-yourself outcomes, we couldn’t resist playing with the configurator ourselves in an effort to max out features and pricing. Would you believe our final price came in at $88,315 for a Ram 3500 Limited Crew Cab 4×4 model with an 8-foot box? That’s more than $20,000 in upgrades punctuated by the high-out turbo-diesel engine. This pickup truck measures nearly 24 feet long. What’s old is new again. Initially introduced as the Dodge Ram 1500 in 2009 before dropping the Dodge appellation beginning in 2011. 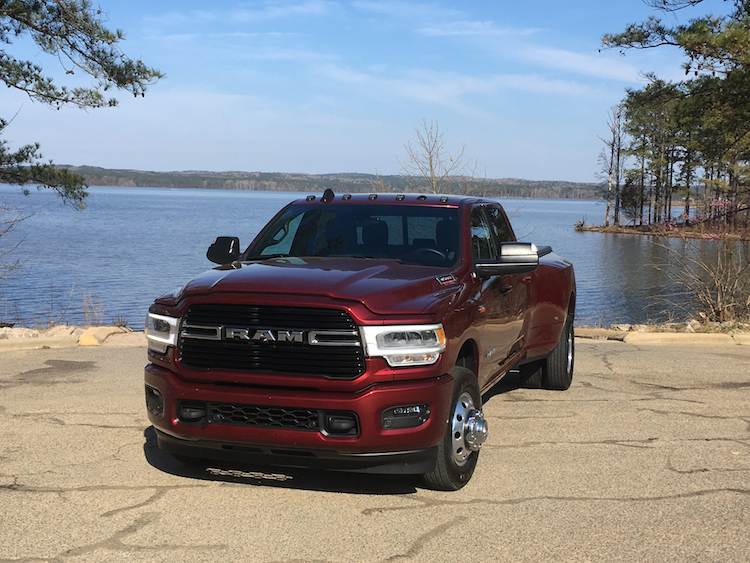 Dodge continued to build its fourth-generation pickup truck in 2019, renaming it the Ram Classic for one year as it overlapped with the new model. Fiat Chrysler is offering both models in an effort to fill back orders as well as to make a smooth transition to the new one. This move has paid off as sales are up 15 percent for the first quarter. As for the Ram 3500, the new model receives its own take on big Ram goodness. 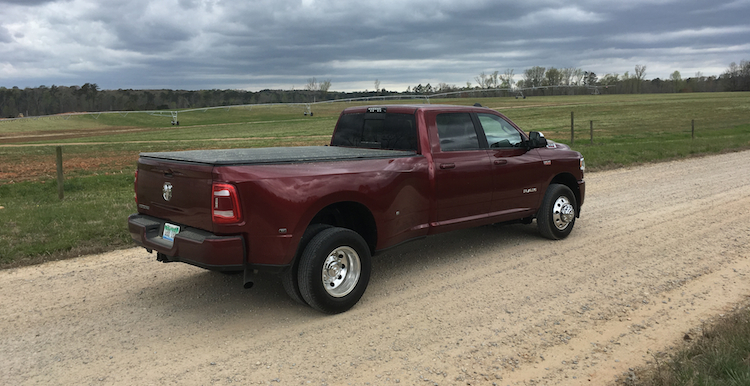 Ram lent me a 3500 Big Horn 4×2 dually for a week, which was the first time a “dually” media fleet model came my way. Is the Ram 3500 imposing? Heck, yeah. From bumper to bumper this truck makes its appearance known, as it delivers a formidable presence. Up front, the big grille is amplified by oversized “RAM” lettering, which is honed in by wing-like trim that also matches the LED headlight treatments. A sizable lower-grille opening and a beveled hood round out this truck’s frontal expression. Ram takes the truck’s slab sides and adds special touches, including vent ports, oversized wheel arches, and trailer mirrors. The most striking feature of all is the truck bed, which expands out at the rear axle. Most designs add a sheetmetal overlay. Here, Ram offers an integrated design, which flows naturally. 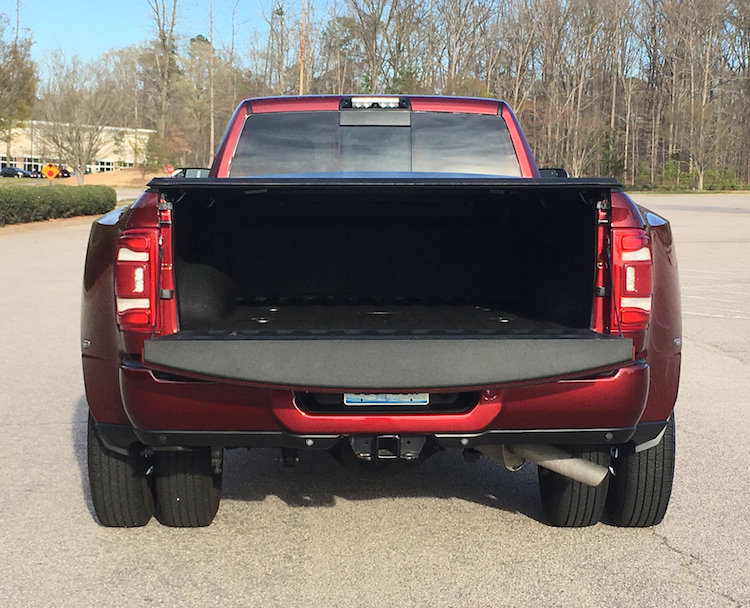 From the rear, the truck features a centered step bumper and LED tail lamps. 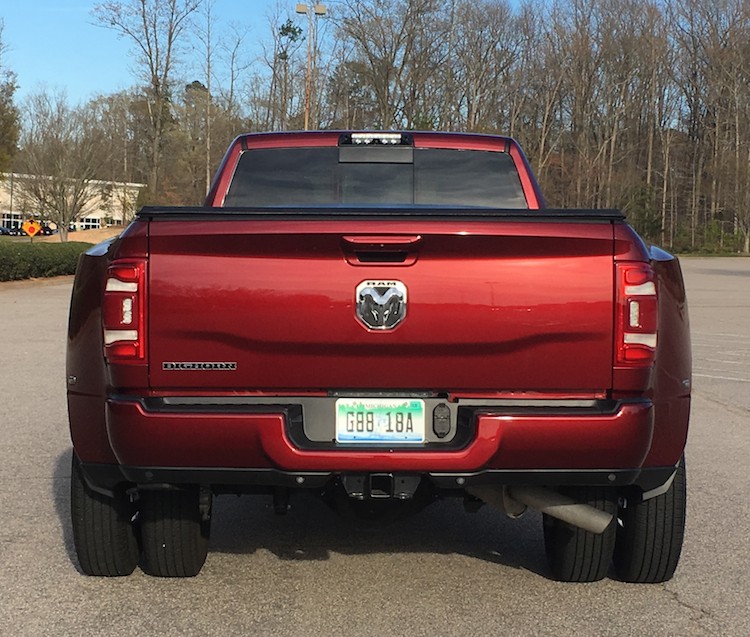 A ram insignia is centered on the tailgate. 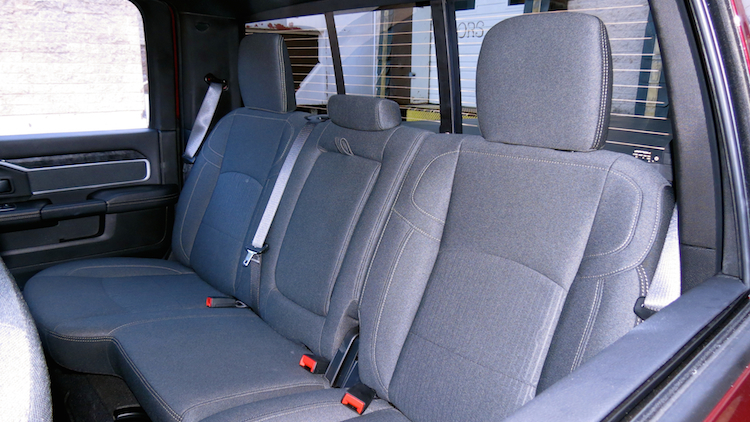 Inside, the cabin is spacious, but especially so with the crew cab model. This model is slightly wider and longer than the outgoing truck, therefore interior space benefits accordingly. Indeed, five big workers can sit in comfort (six with the available front bench seat). Ram sought to raise available opulence with the new 3500 and has largely pulled this off. Not only does it provide a generous amount of interior storage, but some models include leather interiors with real wood trim. As for storage, the sliding storage compartment ahead of the oversized covered compartment between the front seats is a difference maker. My Big Horn model came with generously bolstered front bucket seats and a split-folding rear seat. Fiat Chrysler’s UConnect interface is easily one of the best in the industry. Yes, there are different levels to this system, ranging from basic services with a tiny screen to a full-fledged operating unit with a 12-inch screen, depending on the FCA model, trim and package. 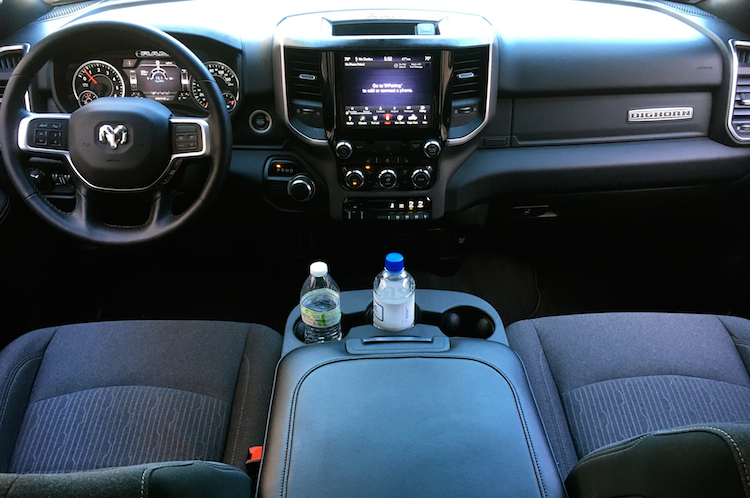 As for the Ram 3500, the system includes satellite radio, HD Radio, and Bluetooth streaming audio. The base models have the 5-inch screen, while package upgrades supply an 8.4-inch screen and Apple CarPlay compatibility. Additional package upgrades bring in the 12-inch touchscreen display and add a 17-speaker Harman Kardon audio system, Android Auto compatibility, and GPS antenna input. You’ll find 4G Wi-Fi connectivity on some trims too. The Ram 3500 was not crash tested, although the 1500 has been. The Insurance Institute for Highway Safety (IIHS) gives the 1500 its highest score in all test categories, although it reserves a “marginal” rating for headlight range and brightness, and “acceptable” for child seat anchors. The list of standard safety features includes electronic roll mitigation, stability and traction control, hill start assist, trailer sway damping, and a rear backup camera. Some models add blind-spot and cross-path detection, front and rear park assist, and trailer brake control. As for adaptive cruise control with full stop along with full-speed collision warning, you’ll find these features as part of an equipment group upgrade on select trims. The Ram 3500 is everything about power. 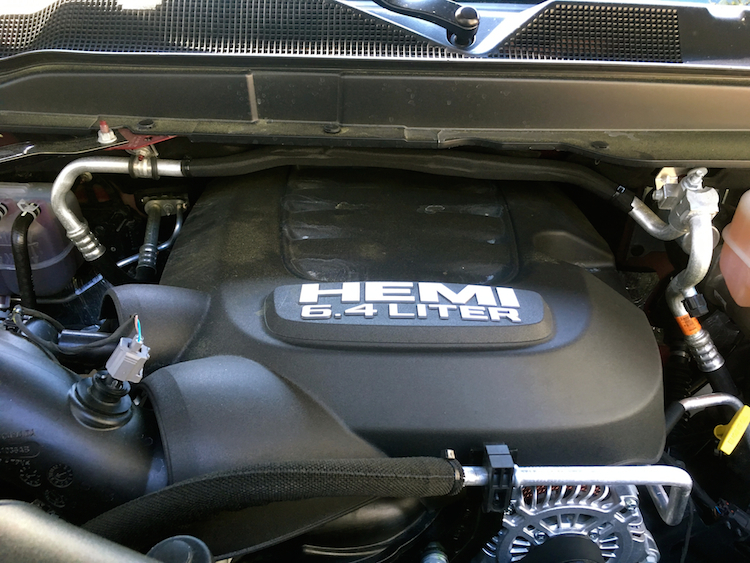 The standard gas engine motivated my Big Horn test model and is rated at 410 horsepower and 429 pound-feet of torque. Ram pairs this engine with an eight-speed automatic transmission. This particular truck’s payload capacity is nothing short of outstanding — up to 7,680 pounds with the gas engine. By the way, the payload covers the added weight in and on the vehicle, including all fluids, people, interior storage, and bed cargo. Inasmuch as the brawny V8 wins the payload capacity advantage (the Cummins peaks about 2,000 pounds under), it is the stout diesel that supplies the strongest comprehensive power — 370 horsepower and 850 pound-feet of torque. The Cummin’s 6.7-liter inline-six, however, trails the Chevrolet Silverado HD’s 6.6-liter turbo-diesel V8 (445 horsepower and 910 foot-pounds of torque) as well as the Ford Super Duty’s 6.7-liter turbo-diesel V8 (450 horsepower and 935 foot-pounds of torque). 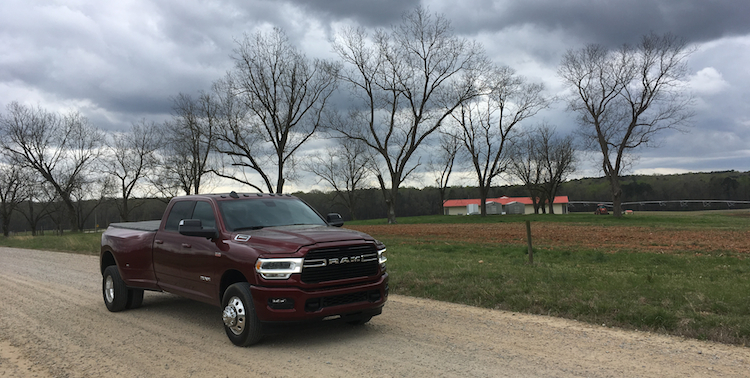 Gas and diesel engine choices power the 2019 Ram 3500. This year, Ram also offers a high-output version of the Cummins engine, which delivers an even 400 horsepower and 1,000 pounds of torque. The latter number represents a new threshold, one that manufacturers fought to achieve for several years. Ram reached it first, although we expect Ford and GM to follow. The battle under the hood translates into trailering bragging rights. Even then, the current Silverado is on top at 35,500 pounds followed by Ram at 35,100 pounds. Ford comes in with 35,000 pounds. These numbers cover fifth-wheel and gooseneck towing. Standard towing is considerably lower and falls to as low as 14,080 pounds with the gas engine, depending on the cab and drivetrain configuration. Still, the ability to pull somewhere between seven and more than 17 tons is simply stunning. Two rear wheels are definitely better than one, especially for towing. But they’re also ideal for keeping this big truck planted when you’re not towing. That’s a big reason why DRW models are beloved by contractors, landscape architect crews, and anyone else prizing these attributes. Make no mistake: this Ram’s sheer size is intimidating — for drivers and other vehicles alike. The gas engine is certainly up to the task, even as it moves more than three tons of girth. 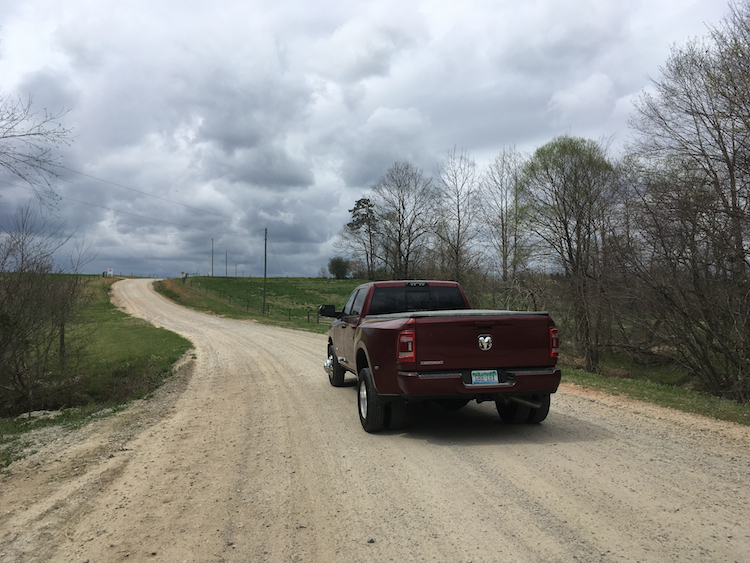 This truck’s step-off acceleration is robust — the only caution is to ensure the rear wheels have enough room to leave a driveway without taking down shrubbery or a mailbox. There is ample power at all times and the transmission shifts with precision. Under hard acceleration, this burly truck presses onward with authority. On two-lane roads, it takes some getting used to driving — the rear wheels and side mirrors stick out far enough to where concern for cyclists is an issue. The brakes are strong, but you’ll need to allow for extra stopping time. Of course, this is especially important if you’re pulling anything. But you knew that, right? As for the ride, you won’t find anything more comfortable, likely due in part to the dual rear wheels. Perhaps the most significant challenge lies with the turning radius as you’ll need all the room you can get. Four rear wheels are better than two, right? In some cases, this is definitely true. I can see anyone who needs to tow a massive amount of cargo opting for a dually as the wider stance increases stability under these conditions. You’ll enjoy the supplemental benefit of a decreased risk in overloading. Braking is also better, while the extra set of tires comes in handy if you lose one during a blowout. 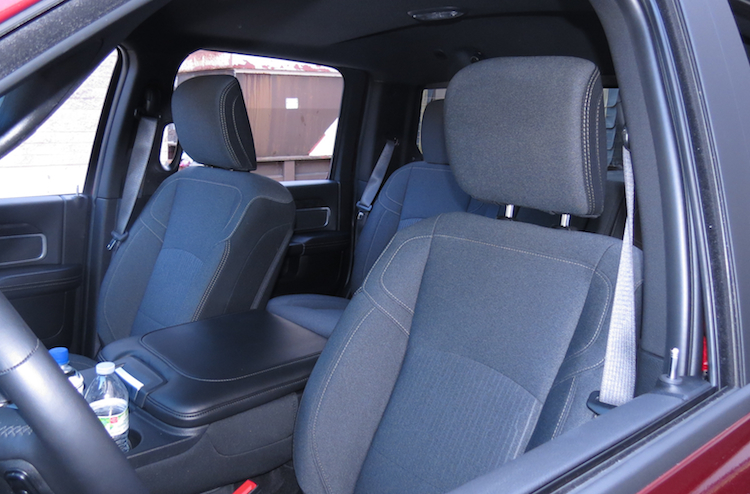 As for a recommendation, a crew cab offers maximum passenger capacity, which is a priority for many work crews. My test model was rear-wheel drive and is likely sufficient for most. It also offers a slightly better benefit in towing, so only opt for four-wheel drive if you think you’ll need it. Lastly, the Cummins option is enticing, but it does come at a sizable cost: $9,100 for the standard one and $11,795 for the high-output version. Regardless of your choice, added pulling power is a big reason to upgrade as well as a diesel’s durability and longevity. 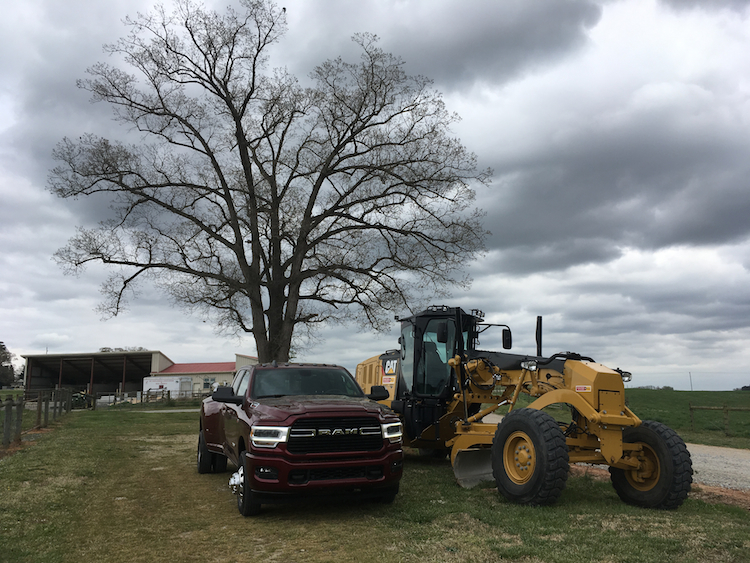 a fitting backdrop for two powerful machines.